Philip Wood was born in Manchester in 1957, was educated at Southampton and trained in pottery at Farnham School of Art from 1976 to 1979. From 1982 he attended the Royal College of Art, and in 1989 set up his pottery in the village of Nunney, Somerset. Philip's work is very distinctive and charming. 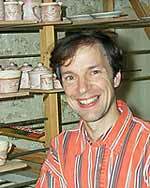 He was first attracted to pottery because he loved stoneware and wanted to make it, but discovered over time that he was best suited to earthenware. He thinks it is because he is English, and earthenware is in his blood like instinct and inherited memory. He certainly uses the medium to stunning effect, giving to it his very personal and individual character. His pots are basically like those made by traditional English country potteries such as Lake's or Verwood's - red clay body with interior and rim coated with cream slip. But Philip doesn't stop there; he applies finely detailed sprigs depicting animals, fish, birds, leaves and ornaments to the pots, together with a small amount of slip decoration, and then paints on a loose slip wash. The colour in the wash settles into and around the detail in the sprigs producing a beautiful effect somewhat reminiscent of a cameo. Philip press-moulds the sprigs and applies them to the leather hard pots using water and an artist's paint brush. It is his skill in placing the birds and animals that gives his pots their charm. Philip's warm and humorous nature and his relaxed attitude shine out in his finished pots. He also works in other styles; slipware in the tradition of Fishley and Cardew, and some work with lustre glazes, but since 1989 he has concentrated on the sprig-decorated pots in this distinctive style interrupted only by giving occasional lectures.